Preheat dutch oven by setting on bed of coals. Chop bacon into 1-inch pieces. Cut chicken breasts in half lengthwise. 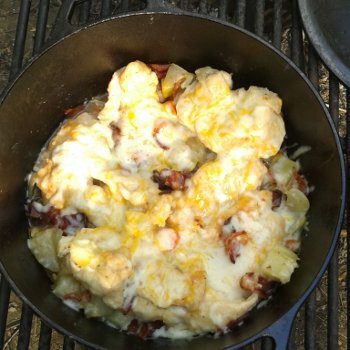 Fry bacon in dutch oven until crispy. Remove bacon from d.o. but leave grease. Shake chicken breasts in baggie of flour to coat. Cook in bacon grease to brown, about 5 minutes, turning a couple times. Pour vegetables, bacon, and Mountain Dew on top of chicken. Cover with lid and cook at 350F for 45 minutes with 3/4 of coals on lid. Using tongs or fork, lift chicken breasts so they are resting on top of vegetables. Cook an additional 10 to 15 minutes. Let me know how you enjoyed your Mountain Dew Chicken!